With this “Guide to finding eyelets” you will find the eyelets that keep you from the life you are looking for. Loosen the eyelets and you will achieve more performance for yourself and more profit for your company. Here you can order the manual for free! 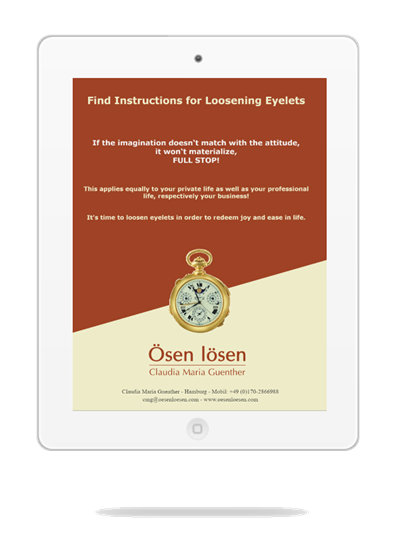 Subscribe here to the Ösen lösen newsletter and receive already in the first newsletter FREE of charge the "Guide to finding eyelets". Use it to find out what keeps you away from the life, that you actually want ...! then your imagination materializes. FULL STOP! Thank you very much for your registration. Please take a look at your e-mail inbox.